Landless: Rule #1. You must write. I write stories every week, and post them as part of #FridayFlash. Why? Robert Heinlein famously gave five rules for writing. I'm not going to Google up a link for them, because I don't need a link, and neither do you. I memorized them a long time ago, and I'm happy to repeat them for you. Rule #2. You must finish what you write. Rule #3. You must not go back and re-write that which you have written, except under editorial edict. Rule #4. You must place what you have written out in the marketplace. Rule #5. You must keep it in the marketplace until it sells. Not too long ago, my fiction was, to put it mildly, crap. I'd started to follow Rule #1, but was failing at Rule #2. Much of what I wrote was fragmentary half-efforts. What I actually finished wasn't 10% as good as I thought it was. I didn't show it much, just wrote in isolation. After sending out some stories to some magazines, and collecting the expected rejections, it dawned on me that marvelous, gripping fiction would not be something I could just sit down and knock out. I would need to learn something about the craft and practice. This blog was part of that effort, a place to interact, ask questions, learn, post my work and get feedback on it. I can't improve my writing if I don't know what works, and what's wrong with it. I don't get paid for any of the material I post here, so Heinlein might take issue with this approach. However, Mark Twain said that you should write for free until someone offers to pay you. I've been paid for my work since starting this fiction endeavor, so I'm going to defer to Twain on this one. By this time, you might be asking, what does all of this have to do with #FridayFlash, and what it means to me? 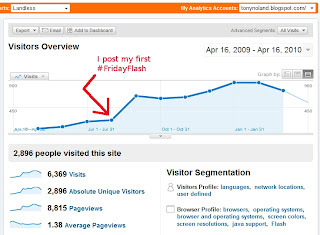 After I posted my first #FridayFlash story, "Nearer Comes the Moon", the readership of this blog more than tripled. That's a lot of eyeballs pointed at my writing. I'm happy with how the readership of this blog is growing. I shill and tout, but people come here (and keep coming back) because they like what they read. That's where #FridayFlash comes in. I have no unique or novel insights to offer on the writing life, on technique or on anything else related to writing. I won't go into the sense of community, the great friends I've made, the private reassurances in fearful moments that I've given and received, the opportunities #FridayFlash has opened to me - both those I've chased after and those that came to me - or any of the other outward-looking benefits of being a regular #FridayFlasher. No, I'm going to focus on what it's meant for my skills as a writer. If you've not read my first #FridayFlash story, or you don't remember it, take a moment and give it a quick look. I've improved so much since then, it's hard to believe I ever let a story go up in that condition. For example, the word "Once" starts paragraphs 2 and 3, and "He" starts paragraphs 4, 5 and 6! Where the heck is the attention to detail? Well, when I started, I didn't know to look at such mechanicals. I was just making it up as I went. It might have been John Wiswell who pointed that tweak out in a later piece, or maybe Lily Mulholland did. I forget, because I have gotten so much valuable advice and feedback on my stories since then. The ones that people went gaga over, the ones that fell flat, the scary ones, the funny ones, the confusing ones - I learned something from each and every one of them. On every piece, I read your comments, I listen to your opinions, I think about what you say and what you don't say. The fact is, my writing is better because of #FridayFlash. I'm a better writer because of the commitment I've made to it. I found a rhythm that works. I found a pacing that I like. I found a voice. Is it my Voice? Shoot, I don't know. All I know is, it sounds like me. It's a voice I feel comfortable in, rather than one I've clumsily sewn together from elements of my favorite authors. There are rules I have yet to follow, and sharp-edged cliffs yet to scale in this writer's path. You know what? Bring 'em on. As I look back on where I've come from, I know what's brought me this far. It's #FridayFlash. This is my entry in the #FridayFlash writing contest. Well said, Tony - this has been a huge learning process for me too and I think we've both come a long way, baby! ;-) I'm so happy to be going on this journey with buddies like you. Absolutely, PJ. The only way to do this thing is if the fun outweighs the struggle, and I'm glad you're down in the trenches with me! Great post Tony. I too use my blog as an exercise, although I don't focus on stories as you do. The name says it all, heh. Great to see the principle that 'great content will attract visitors' in action. Mariblaser: I'm fortunate in that I started this blog about the same time I joined Twitter. That's a perfect microblogging outlet for the regular day-to-day ramblings and silliness, freeing up this space for working on my writing. Bubblecow: Thank you! I'm not above giving word-of-mouth a little help with tweeting links & such, but content is everything. All the promotion in the world won't help a restaurant that serves bad food. You really have a commitment to #FridayFlash and it is great to see all the benefits of long-term participation. I think your description of finding your voice is so wonderful - what a wonderful gift from this exercise. I think you are right - when I read your posts - I know they are a "Tony Noland" piece, even though you write several genres. I'm not sure if I can really tell you why - I think that is a compliment to people who have found their voice. I know they are a "Tony Noland" piece, even though you write several genres. Thank you, Anne! I find this really touching, for some reason. It's funny... when I stopped worrying about Finding My Voice and just started writing regularly, I think my Voice found me. Wonderful essay Tony. It's been a grand trip and nowhere near over. Indulge me for a moment, but - OMG!! "Nearer to the Moon" was your FIRST #fridayflash. It gives a whole new meaning to the luck truck coming hurtling down your highway. All those crappy start of sentences thingos aside (yes I so have not got my editor hat on right now!) - I didn't notice. That story entranced, wooed and wowed me. And you know - it is the strength of that story and me seeing you in the Twitter-verse which led me to invite you to be part of CW. It is very true, what you write about finding your rhythm. I feel as though I have completely lost mine. When I started back writing at the end of 2008 I contributed every week to [Fiction] Friday. It became the pulse at the centre point of my writing life and everything flowed out from there - my partnership with Paul and Annie with Captain Juan, my business relationship with Paul creating eMergent and CW... the non-fiction projects we are picking up... but for me, recently I've been feeling lost as a writer. And I know where I have to go back to, to pick up the path. And your essay today reminds me - actually, hammers it home, what I need to do again to stop feeing adrift. I'd say Mr Noland you're no longer Landless, you have have very much made Land-fall and more than found your feel.. In my whirly-gig life, this is one of the few blogs I make time to stop in and read. So thank you! Thank you for reminding me of the essence - of what is important. Well, damn. Luck truck indeed! That just goes to show that the best time for someone to start writing is twenty years ago. The second best time is right now. I can't really accept that I've arrived at a destination in this journey. I feel like there is still so much to learn, so many skills to practice and hone. However, after sailing this sea for a while, my palms and feet are decently callused, I can tell a good wind from a bad one and I've gotten pretty good at handling the rigging. I'm so glad this essay has inspired and reinvigorated your writerly instincts. It can be so easy to get caught up in the publishing aspects that the core of it all, the writing, can get set aside. Why do I write essays and reflections, in addition to #FridayFlash? And I know where I have to go back to, to pick up the path. And your essay today reminds me - actually, hammers it home, what I need to do again to stop feeling adrift. Great inspirational essay, Tony. I learned a lot - hadn't heard of the Heinlein rules before, but I certainly recognise the 'Noland' effect of finding voice and ryhthm. The benefit of great feedback from a lively community is so valuable. I really enjoy reading your pieces and your commitment is indeed impressive! Well some are. You are. I - less so. Congrats on your blog traffic. Congrats on the improvements you see in your writing. Congrats, in particular, on your writing. Jon, Simon, Kevin: Amen, Amen, AMEN! I give credit to #FridayFlash because it's a standing deadline. I can procrastinate with the best of them, but Friday comes once a week, whether I've written a piece or not. All the excuses in the world won't stop Friday from coming. Working towards that means 10, 20, 30, 40 or 50 thousand words I would otherwise not have written. LOL, the though of having an entire effect named after me is rather intriguing! Thanks for your comments, guys. I'm glad you found it meaningful. Tony - here is my response to this. The power of the deadline . . . I've gotten to the point where I'm working consistently on projects, which is good, but the whole wrapping them up, polishing, finishing, moving on to the next stage (and out of the current comfort zone) has not been happening. So I'm entering some chapters in a contest and taking an online class that will result in a ready-to-send query: self-inflicted deadlines, still, but it's pushing me out of "hey, I made my word count" complacency. 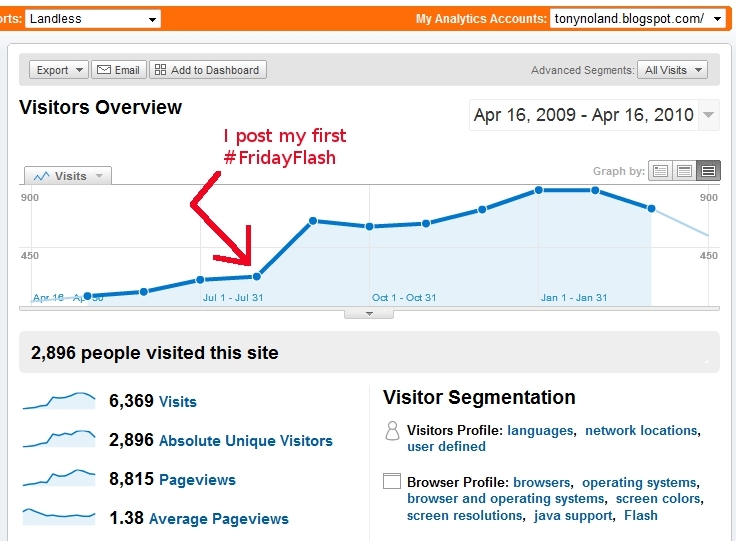 That graph really does illustrate an amazing power of #FridayFlash. I've also noticed the increase in traffic, but also the increased in engaged traffic, people that comment and interact, retweet etc. Didn't recognize this was the no 1 rule for a while, but now have no idea how I could 'not write'. Ann, Benjamin, Estrella: It's funny how the biggie, the one thing that is absolutely essential, is something that can slip away. With all the talking about writing, planning for writing, thinking about writing, sometimes actually writing gets short shrift. Very well-said Tony! I, too, began both my nonfiction and fiction blogs strictly for practice and am astounded at how far they've taken me, both in refining my skills as a writer and in garnering new, and valuable friendships. Man, I gotta work on those rules. Great post! Fridayflash is an amazing venue to find your voice, try new things and just plain make new friends! Great post, Tony! You write as if you're sitting beside me, sharing an intimate conversation. Enjoyed reading it--thanks for the post! I have seen your writing get stronger with every piece Tony, you're well deserving of the following you get and I know many, including myself, owe Jon a debt of gratitude for the forum where people feel comfortable providing constructive critique. Well stated. Wonderful essay, but no surprise there. It doesn't hurt that you started off quoting rules by one of my favorite authors (well, if you catch his 50's work anyway). You packed so much detail and information in here. Great job, and good luck!